Britney seems to think that everyone in this world knows how to make the dessert. Remove the plastic top of the ready made graham pie crust and line the bottom with very thinly sliced 1 and 1/2 banana. 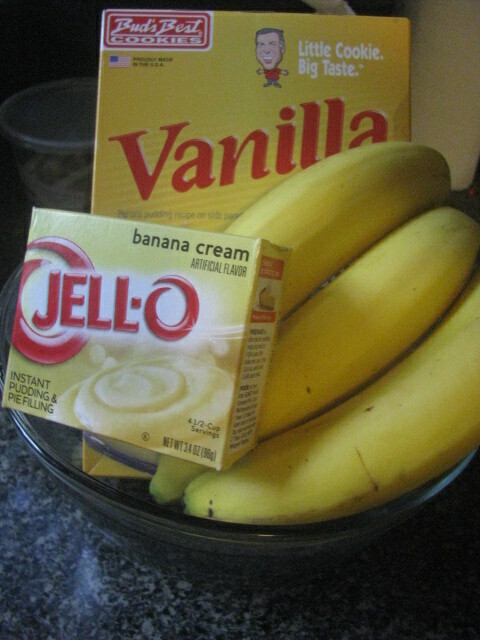 In a separate mixing bowl, whisk together the cold milk and the Jello Banana Cream Instant Pudding powder. Whisk for 1 minute, add the liqueur, continue whisking and when the cream is soft divide it in two portions. Cover the bottom layer of banana with half of the banana cream. 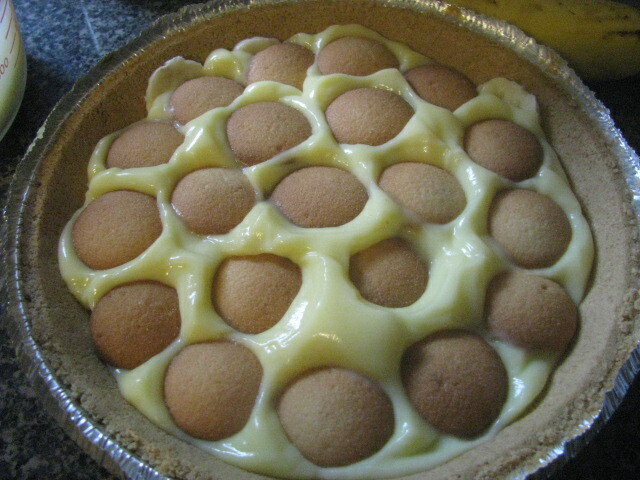 Insert and layer the vanilla wafers in the layer of banana cream. Top the wafers with the second layer of banana cream. Decorate the top of the pie with whipped cream and refrigerate for about 2 hours. In a double boiler, combine sugar, flour and salt; stir in the milk. Cook over boiling water, stirring until thickened. Beat egg yolks and stir gradually into hot mixture. In the double boiler, stirring constantly cook 5 minutes. Remove from the source of heat and stir in the vanilla. Preheat the oven to 425 degrees Fahrenheit. On the side, line one quart casserole with Bud’s Best Vanilla Wafers (bite size) and thinly sliced bananas. Pour vanilla custard over the bananas. Repeat ending with a layer of custard. For the topping: Beat to a stiff peak the egg whites and beating constantly add 1/4 cup of sugar. Distribute the egg white mixtures over the pudding casserole and bake in preheated oven 5 minutes.